Berkeley Services has been in business since 1975. Located in Conroe, TX, we service Montgomery County and the greater Houston area. 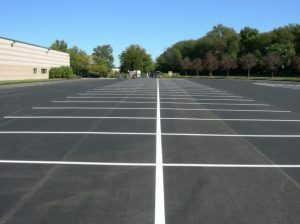 We specialize in new parking lot striping, re-striping, and dustless blasting paint removal. Fresh parking lot striping not only provides aesthetic value, it also informs the public that the business pays attention to detail, cares about its guests, and is professional. Parking lot striping Conroe provides an inviting environment for guests of any local business. 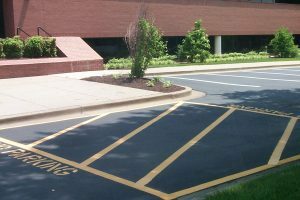 We take pride in our parking lot striping and provide the highest quality line striping services. We don’t just paint over existing faded striping, we use a dustless blaster to remove all old and chipping paint. This process allows us to lay down fresh line striping that will last much longer than the traditional method. Berkeley Services line Striping, will work with all local businesses in Conroe, TX that have a parking lot. “Rather big or small, we will stripe it all” is our our parking line striping motto. With our business located in Conroe, Texas, we enjoy line striping for our neighbors and helping to make our community beautiful. No matter what type of business you have in Conroe, we help your parking lot make a statement with fresh lines and bright colors. Fire Lanes are important for both Conroe city compliance and the safety of your visitors. Proper fire lane striping can not only save lives, but it is mandatory by the City of Conroe to assign designated areas for emergency vehicles. At Berkeley Services, we can ensure that we are familiar Conroe’s compliance codes, and we will make sure all fire lane striping is clearly marked and visible. 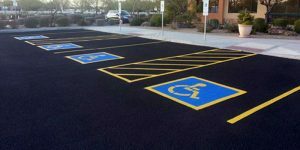 The average cost to line stripe a parking lot depends on the quantity of pavement markings and whether the parking lot is being re-striped or is a brand new layout for parking lot paving and seal coating.